Tech pros have one foot grounded in today's hybrid IT realities while also setting their sights on emerging technology, according to IT Trends Report 2019: Skills for Tech Pros of Tomorrow, a new report from SolarWinds. Specifically, tech pros have prioritized systems and infrastructure, security management, and hybrid IT skills development in the past 12 months. When it comes to the next three to five years, they are looking to develop skills in areas like artificial intelligence (AI) and big data analytics, while eyeing career paths such as data science and coding. However, without improvement in time and budget constraints, the majority of tech pros (75 percent) say they will be unable to confidently manage future innovations. This reality ultimately puts businesses at risk of performance and competitive advantage losses, making the prioritization of skills and career development for tech pros paramount. 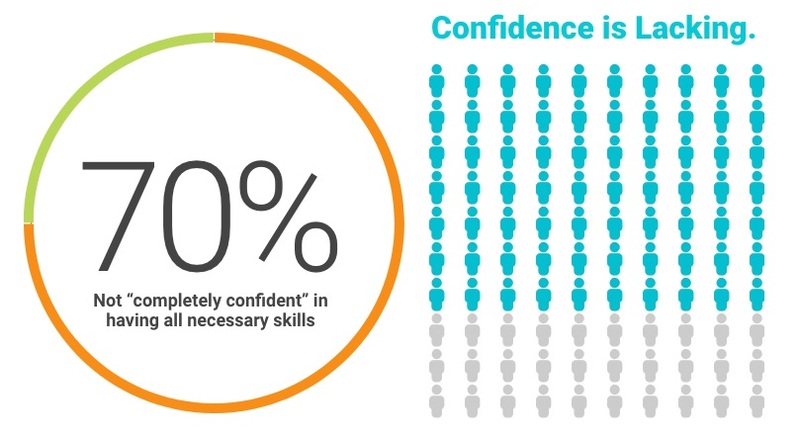 75 percent of all tech pros surveyed are not "completely confident" in having all the necessary skills to successfully manage their IT environments over the next three to five years — even though 99 percent of tech pros have worked to develop a skill over the past 12 months. As business size increases, so does confidence. Half (49 percent) of small business tech pros are somewhat to completely unconfident in their ability to manage environments into the near future with current skillsets, compared to 31 percent of medium-size tech pros and 27 percent of enterprise tech pros who share this sentiment. An August 2018 Deloitte survey of SMB executives revealed that 57 percent of the respondents surveyed are planning to spend more on IT this year than they did in the past year. These findings are echoed in a recent Tech Pro Research study, which found that nearly half (44 percent) of participating technology professionals ranked internal employee training and development as a critical priority for 2019 IT budgets. According to the Gartner list of strategic technology trends (see video below) that have the potential to disrupt and are on the verge of becoming more widely used in the next five years, AI and quantum computing both rank in the top 10. There is a great opportunity for tech pros to increase their knowledge of these technologies and to have productive conversations with businesses on the reality of implementation in the near future. This is in line with what tech pros say will be most important to their organizations' transformation over the next three to five years (by weighted rank): cloud and/or hybrid IT, and SIEM and/or threat intelligence. It's also in line with findings from the SolarWinds IT Trends Report 2018: The Intersection of Hype and Performance. Last year, 81 percent of surveyed tech pros worldwide said cloud and hybrid IT are among the top five most important technologies that will drive their organizations' digital transformation over the next three to five years. Tech pros' instincts are correct when it comes to their top two skillset areas as they are expected to see continued growth, according to Gartner: The firm predicts that the Worldwide Public Cloud Services market will grow by 17.33 percent in 2019, going from US $175.8 billion in 2018 to US $206.2 billion this year. Data science and analytics round out the top three skillsets tech pros plan to develop in the next three to five years. Data science and analytics will be an important skillset to watch for tech pros, as it has steadily emerged as a field of practice over the past several years. According to the Indeed Hiring Lab, data science postings in the US have increased 344 percent since December 2013. This rise signifies a growth of data science in IT environments and a need for tech pros to build their skills accordingly to provide support. The desire to build skills in data science also hints at tech pros' preparation for emerging tech like AI.